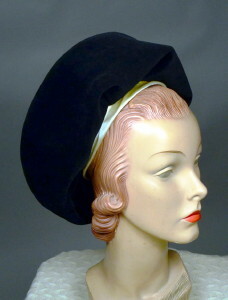 1960's vintage velvet HAMMOND RUTHERFORD MUSHROOM hat. Ink black velvet with ivory satin band. Large pleated bouffant crown with ivory satin band. Wide black grosgrain inner band. In the sixties, whether a hairdo or a chapeaux BOUFFANT was high (HIGH) fashion!! Crown height - 6 1/2"
Width, measured from side to side - 7"
Circumference (measured at brim edge) - 20 1/2"
EXCELLENT condition! Just slight age discolor at band seen only on close inspection.